Sloppy Joe Bubble Up - homemade sloppy joe mixture tossed with chopped refrigerated biscuits and topped with cheese. Great twist to your usual sloppy joes. Tastes great! 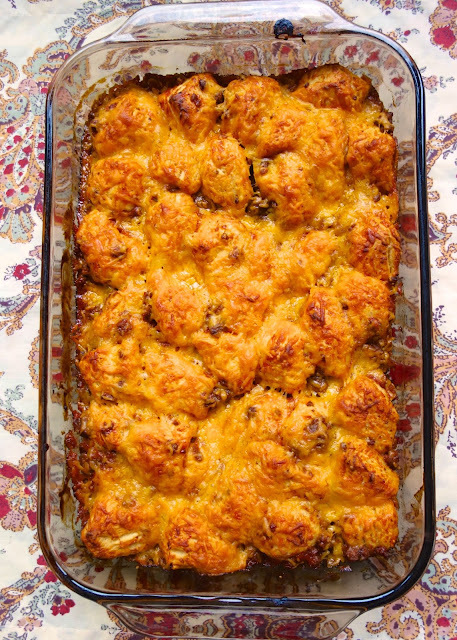 Even picky eaters like this casserole!! Chicken Legs loves sloppy joes. I am not as big of a fan because they are so messy! Looking for a way we could both enjoy sloppy joes, I decided try a bubble up. YUM! All the flavor of a sloppy joe, and it isn't messy. Maybe I should call this Unsloppy Joe Bubble Up! I made the sloppy joe sauce, but you could use a can or packet of sloppy joe mix if you don't want to make your own. 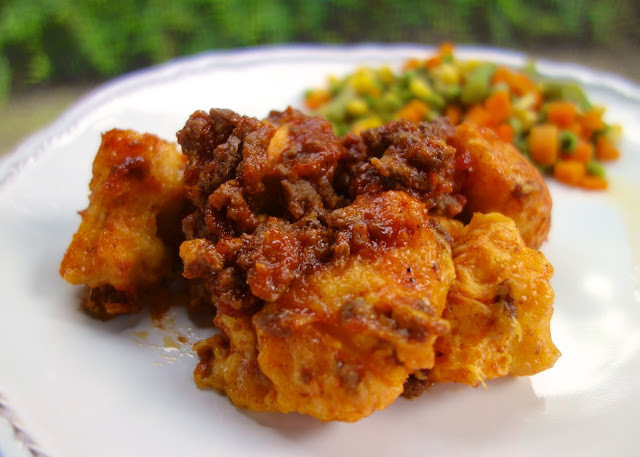 The sloppy joe mixture can be made ahead of time and tossed with the biscuits when you are ready to bake. I use the smaller canned biscuits as opposed to the Grands!. 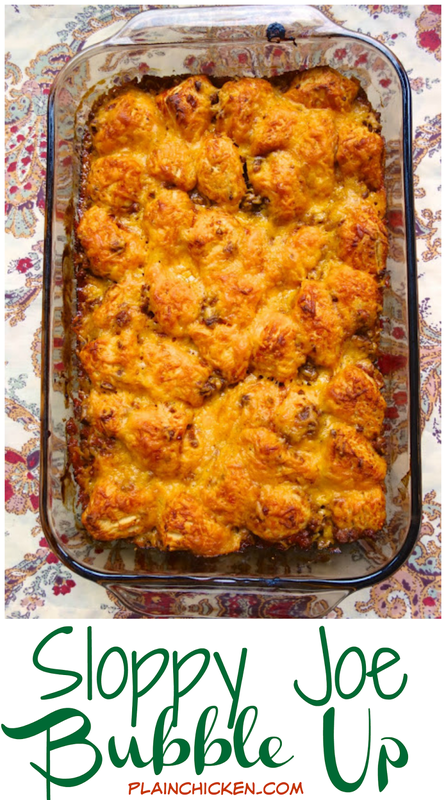 I find that they cook better in these bubble up casseroles. If you use the Grands!, I suggest cutting each biscuit into 6-8 pieces so they cook through. In a large skillet, brown ground beef. Drain fat. Stir in ketchup, water, brown sugar, Worcestershire, mustard, garlic powder, onion powder and salt. Simmer for 5 minutes. Remove from heat. Cut biscuits into quarters and place in medium bowl. Toss biscuits with meat mixture. Spray a 9x13 pan with cooking spray. Pour biscuit mixture into pan and top with cheese. Bake for 25-30 minutes, or until biscuits are done. Much less sloppy indeed! I'm going to remember this one for a comforting meal on a snowy day. Just made this and it is delish!! However will have to add more meat next timen , it was more biscuit than meat. You heifer! I thought I'd thought up something no one else had! Blast it! It's like we live in the same head. Or stomach. Oh well! I'm making something very similar over the weekend! LOL! I do the same thing! Enjoy your version!! Made this last night. Delish! Thanks for yet another winner! Made my first bubble up tonight. This was pretty good. I added a little chopped up onion and red and green peppers and used garlic other than garlic salt. Will be trying one of the chicken ones next. Thanks for a great idea.